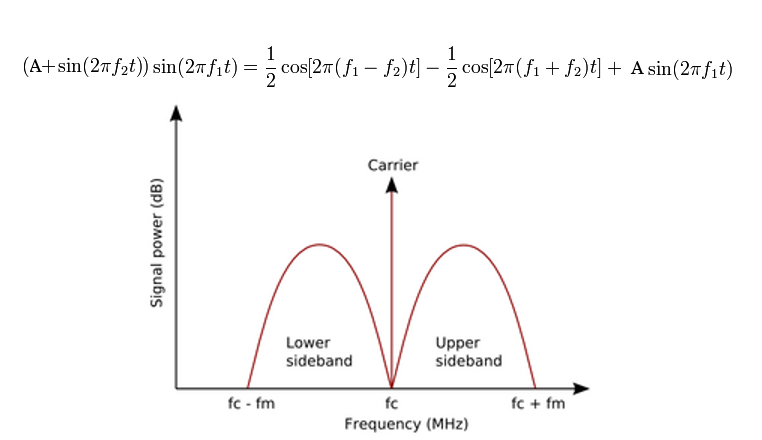 Amplitude Modulation, as in AM radio, is a real world application of trigonometry, and AM radio has been with us for over 100 years. 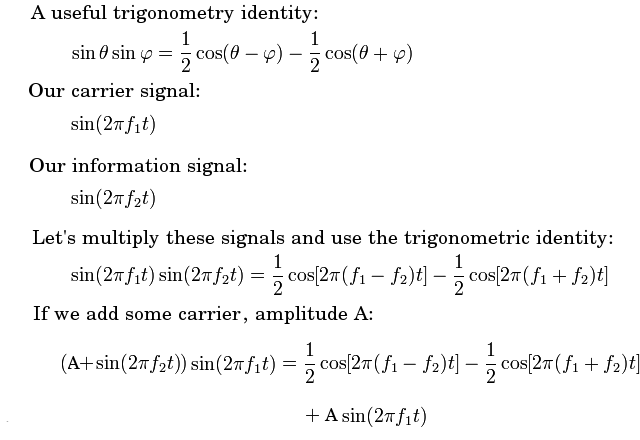 Some of you may recall the trigonometric identity for multiplying two sinewaves. 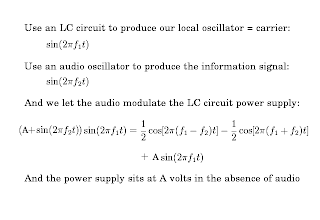 So, we have shown mathematically how to amplitude modulate a radio wave carrier signal of amplitude A with an audio signal. This results in the final equation with upper and lower sidebands of amplitude +1/2 and -1/2, and the carrier sine wave of amplitude A. 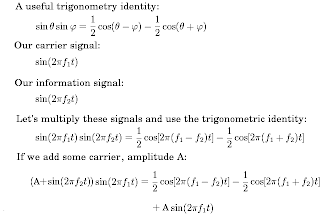 From this diagram, it becomes obvious how the three terms of the equation arising from the original trigonometric identity relate to the lower sideband, upper sideband, and carrier in an AM broadcast. 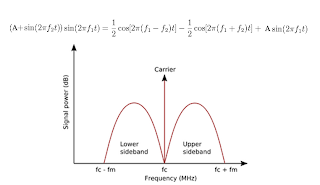 As an aside, if you have heard the term "lower sideband", "upper sideband", or perhaps "double sideband" transmission in amateur radio, these modes should make a bit more sense now - they are transmissions missing one or two of the above three terms to save on transmitter power. So, how do we use this theory for circuit bending? 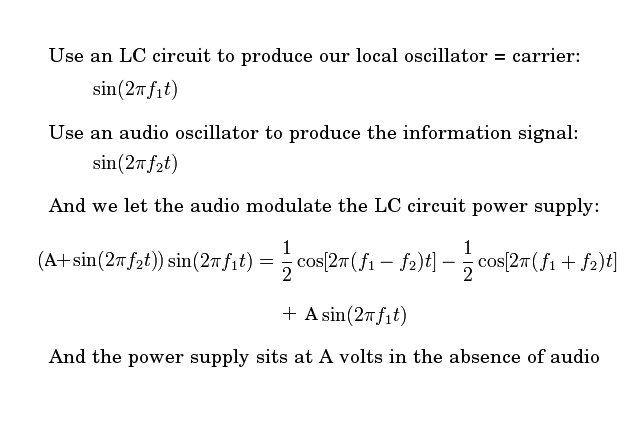 Simple, we use an existing LC oscillator generating a radio frequency (RF) carrier, and we then feed an audio tone into the early stages of the RF output amplifier, to modulate the amplitude of the final RF output. A kit built VK5JST antenna analyser will serve nicely as a source of RF (from http://ahars.com.au/htm/jst_aerial_analyser_kit.html ) that can then be heard on an old school AM radio. This VK5JST antenna analyser is a handy piece of test equipment which can serve as a source of RF from 1.3MHz to 31MHz (and sometimes more, i.e. 200khz to 50MHz, if you do the necessary mods...), usually used to tune antennas to resonance for your desired frequency range (a.k.a. band) of radio activities. So, how do we circuit bend this source of RF into an AM chiptune transmitter? Well, the antenna analyser uses a PicAXE microcontroller for frequency and SWR readout on an LCD display. It also just so happens that 28X1 and newer PicAXE chips can squirt an audio tone out, including RTTTL music formats, on a spare pin if asked nicely. First, we install the optional serial port header, so that we can install cabling from the PCB to a stereo 3.5mm audio jack. This is done in keeping with the standard PicAXE convention of ground (tip), PicAXE serial data in (ring), and PicAXE serial out (shaft). We see that pin 21 is unused. It'll do. Next, we need to decide which bit of the circuit to squirt the audio into, to amplitude modulate the RF signal generation portion of the analyser. Somewhere around here should do. 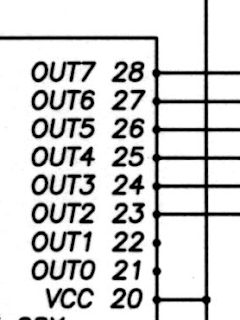 First, we try jumpering a lead from pin 21 to the base of Q5, via a 1uF DC blocking capacitor and a current limiting resistor. Remember, this is a quick and dirty hack... but most circuit bending is. Although the hack is likely to affect phase and frequency stability a little, it shouldn't be noticeable with AM reception. We start with an test audio tone of around 800 hertz, using a squarewave to mimic what the PicAXE will be providing in due course. Here are pictures of a dual trace CRO (oscilloscope) showing the audio tone on the lower trace, and the AM modulated RF waveform on the upper trace. Each picture shows the increasing modulation and increasing waveform distortion arising from reductions in the value of the series resistor going to Q5. In the last CRO picture, we see over-modulation, and the RF waveform goes to zero for a proportion of each cycle. This confused the frequency counter in the antenna analyser and it reads low, so it's best to use a higher value resistor and to not overmodulate. The modulation also appeared to be subject to the increasing correction by the AGC loop, and although the tone could be heard on a nearby radio, cleaner modulation was desirable in order to reduce "splatter" and harmonic generation. To fix this, another approach was needed, and after contemplating various schemes, one requiring minimal modification of the PCB was chosen. 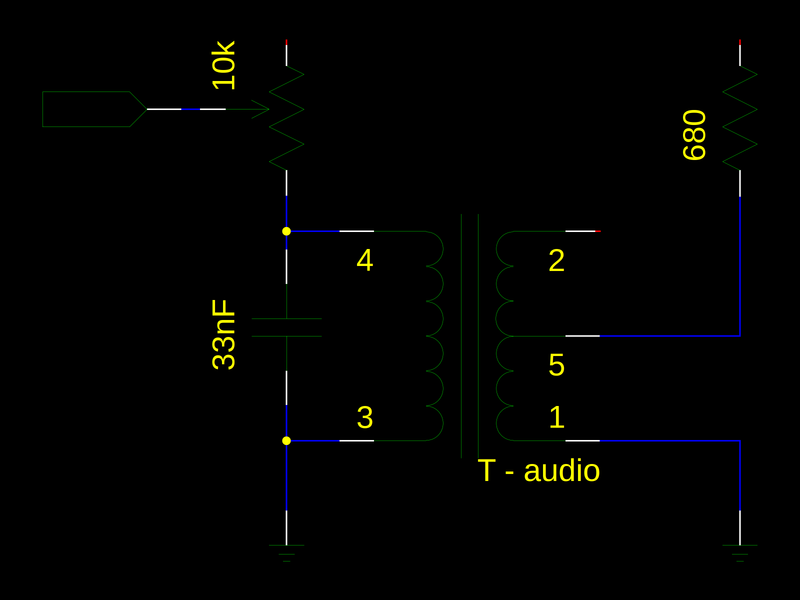 The audio transformer had been gutted from a radio many years ago, as had the33nF capacitor, and these were used in conjunction with a 10k multi-turn potentiometer. 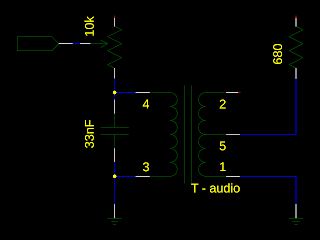 The effect of the potentiometer and capacitor was to form a voltage divider that directed current into the transformer at lower frequencies, but shunted higher frequencies straight to ground through the capacitor. This is also known as a low pass audio filter. 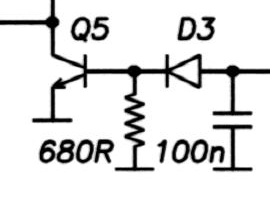 This circuit could be interposed between ground and the 680 ohm resistor (also shown in the circuit diagram). And here's the circuit being patched into the analyser more permanently. And finally, to complete the hack, additional code was added to the antenna analyser's PicAXE micro to make it play ring tone music, squirting the audio out on pin 21. In summary, we have used trigonometry to circuit bend a kit built antenna analyser into an AM radio transmitter, and we have even managed to Rickroll it while we were at it.